Who is ready to rock your workout with some new gear? I'm on a healthier lifestyle journey and I'm personally so excited to get some of the MPG brand clothing to workout with at the gym. I'm finally needing new and smaller exercise tops and bottoms and ready to try the MPG line. My teen, who works out with me, told me that I needed new clothes. Some of my shirts she told me to stop wearing because they are way too big for me! What do you work out in? 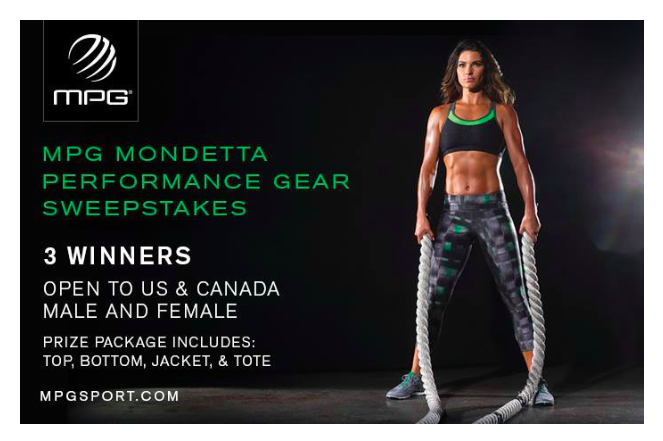 Lucky you I get to bring you this Rock Your Workout Event Sweepstakes where 3 of you will win big! Enter below. Truly powerful action is the result of an equally passionate vision and drive to achieve. Behind the energy for perfection surges the will to attain it. In recognizing this balance, MPG has developed a line of clothing that seamlessly blends fashion and function, design and performance. The results are richly detailed pieces with a technical edge — an entire collection unparalleled in conception and construction. MPG, inspired by the smooth, strong movements of performers such as athletes and dancers, celebrates the drive, dedication and perseverance of these phenomenal individuals. MPG applauds their unyielding pursuit of excellence, through sacrifice and discipline, with respect and admiration. The brand’s versatility allows for more than just function; it embodies style and comfort by offering a range of clothing to suit any activity in any environment, at the apex of vision and vigor. We welcome you to experience the World of MPG. Go HERE to check out MPG's website!